Keith Adams tells the story of the Rover 55 – the 75’s smaller brother, and part of a two-pronged attack on the premium car market for the mid-2000s. The Rover 45 was one of the longest-lived stop-gap cars produced in a very long time. We all think of the Morris Marina as a car that outlived its usefulness by many, many years (1971-1984, if one considers the Ital a Marina), but the Rover 45 equals that achievement when one considers that the Honda Domani was launched in 1992 and the final 45 rolled out of Longbridge in 2005. Thanks, of course, to its sophisticated suspension set-up, the 45/ZS was actually a pretty accomplished steer – but, in truth, it wasn’t designed to last much longer than 2000. That’s where the Rover 55 comes in. Back in the late 1990s, Rover engineers and designers were already hard at work on creating an all-new replacement. The initial plan had been for Rover to become a premium brand, with a two-model attack on the upper-medium segment. That would have meant the introduction of the Rover 55 in 2002, followed by an all-new 75 in 2004/2005. Both cars were to be powered by the much talked about BMW NG engines in four- and six-cylinder form. Most intriguingly, the front-wheel-drive cars’ powerpacks would have been longitudinally-mounted, rather like FWD Audis. Belying their Bernd Pischetsrieder-era conception, the engines in the 55 and 75 would have been mounted rather a long way back in the chassis – just as the current Audi A4/A5’s are – and, as well as FWD, it was planned to offer the Rover 55 and 75 in 4WD form, too. These exclusive images, supplied by Nigel Garton, clearly show that the 45’s replacement was due to grow. That was also going to be the case for the next Rover 75. 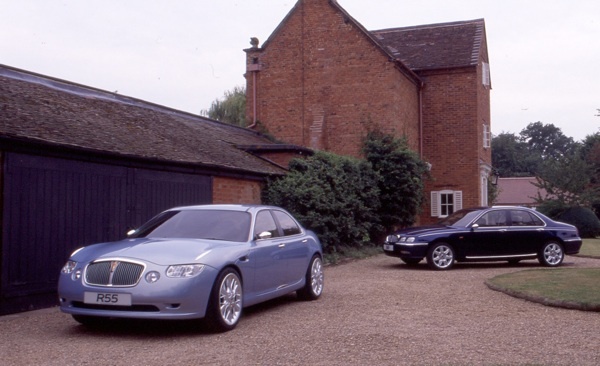 This was part of a new two-model strategy that would see Rover producing what one designer referred to as a pairing of BMW 3+ and 5+ Series models. What came of this car? Well, in late 1999, the dual model policy was cancelled, with the Rover 35 (R30) programme taking over when BMW decided it was a better idea to take Rover downmarket instead. Euggh, that is well ugly. Looks like some vile, bloated American roadster. I honestly can’t see it having caught on. Oh, and that gigantic grille – horrible! I disagree. This is a masterpiece of styling. All of Richard Woolley’s work for Rover – such as the 600 and 75 – was from the very top drawer. Wow. That’s phenomenal. You can see the relationship to the 75, but that would’ve offered something totally different to the 45 and a unique product. This stuff makes me heart ache! Still, more fantastic work from Keith and AROnline ! With a few tweaks here and there, that’s just the sort of car Rover could have done with in the 2000s. Once again, Rover were bang-on the money with a car that sadly never saw the light of day – unless one looks towards BMW’s 1 Series. Whatever, this car, with its exaggerated features, would still be cutting a dash today. Oh, how my glass eye weeps when one looks at how many cars could have saved Rover and made a bit of money. Dare I say it, those front wings/headlamps impressed somebody in the current 3 Series saloon’s Design Team. 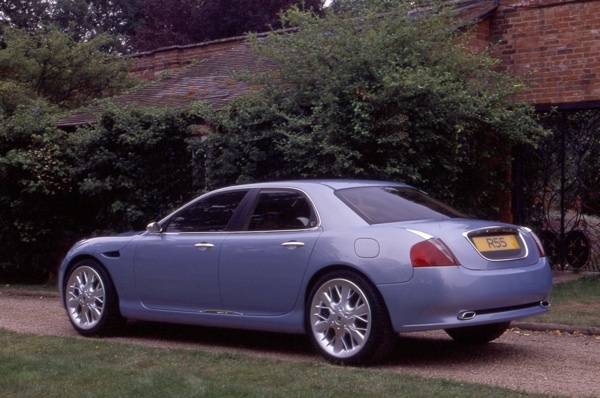 It is certainly imposing, as any Rover should be, with the same sense of serious intent as the Rover 75. A shame that MG Rover Group were presented with little/no opportunity to pick up the R55’s baton, refine its design a little and put it into production. Those outer headlamps remind me a little of those on a Z4. Ah, yes. Years ago, I did an Insider piece for CAR about the chassis chap who had been in charge of the MINI front end [and was, post-Rover, involved in a small sportscar car project]. He told me he had worked on an Audi-styled longways FWD chassis which was suddenly pulled. Here it is. I’m also intrigued that these cars had to be bigger than was typical for the market segments they were aiming at. Why was Rover always doing that? Most interesting was the idea that the the R30 (also too small to be Golf but much bigger than a Fiesta) would sit at the base of the BMW range, presumably alongside the MINI. The more I look at this the better it gets – would the MINI-esque clamshell bonnet have made production? I love it, but you’d expect that from a bloated, vile American. It has the looks of the Chrysler 300C, but with much more flair and grace. There’s also a touch of Lancia, before all the weirdness set in. My hope is that someone at BMW kept all of the notes concerning Rover under BMW’s reign and that these eventually will be released. That cars like this 55 concept were under consideration and a vehicle like the R30 was taken as far as it was before being hidden away in Munich is fascinating. Mix in the missteps, blunders, corporate intrigue and the like, and you’d probably have a pretty good novel! I thought 300C as soon as I saw it. I think with a few tweaks it could have been a winner. My first thoughts were a Jaguar XF crossed with a modern Bentley and the R75. This is a stunning car and well ahead of its time, still looking very modern today, and making the R75 look very old. Great stuff Keith, yet more of the blank spaces in ARG/RG history filled. Wow, what a fabulous design. This combines much of the nice retro nature of the Rover 75 (and the fabulous clamshell bonnet of the pre-cost-cutting R50 MINI) into a modern design that would not have seen all the young buyers running for the hills in the way they did with the R75. I would have been proud to buy one. This shows that Rover was very capable of designing appealing cars. The only aspect I do not like is the bonnet shape and its shut line over the grille. What a terrible shame it never came to market. A design like this also shows how misguided BMW was in its decision to move Rover down-market. Wow, if that was built now it would be one of the best-looking cars on the road today. It’s like a rounder and curvier Chrysler 300C but, of course, it predates that design by a few years. I really like the bold design. I think it would look absolutely stunning in black. I’ve never been a fan of the original Wedgwood Blue on the 75 and have the same opinion on this clay model. Longitudinal engine and front wheel drive – but why? Could this account in some way for the NG engines’ rather compromised dimensions? They seemed to be set solely to ensure that the sixes were as short as possible – learning at the E-Series fountainhead. Perhaps Pischetsrieder was settling some old grudge against his great-uncle by telling the world that Harry Webster was right after all. I like this car. I think it could have been a great car, but I can also see why MGR didn’t introduce it. It wasn’t what they needed as a company at the time, when they were in such trouble, especially not as a 45 successor. I just see this as an executive car, a competitor to the Jag S-TYPE and the offerings of BMW. What MGR needed from the 45’s successor was a good quality Focus/Astra rival, not this. Not to mention, as I’ve seen from other comments here already, it may not have gone down so well with Rover’s traditional market. Still, perhaps a variation on this design theme could have been used on a smaller car. It was certainly stylish for 2002. Actually this looks more upscale than the 75 in a lot of ways – I like it, all things considered, and it’s a shame it never got to market as it is a whole lot better than the 45 as regards styling. Regarding front/long engines, a lot of manufacturers have used that – one being Renault with the 25s – and it has much to recommend it. It allows better access to service parts for one thing and, given that many cars will have a range of engines over their lifespan, allows more space for up-engining. The problems with putting a bigger engine in a tightly packaged transverse arrangement are obvious. I think this would have done well had it been introduced and would have been better than the admittedly successful re-warmings of various models. The only problem is that it’s such a step forward that it would have highlighted the comparative age of the 75. I like the chrome accents on the wings – I never did like the swage on the 75 – I think, looking at the 55, that could have been improved using this type of accenting on the front and a marked chrome piece coming from the bottom of the rear side window along the bodywork swage/bootlid line. It certainly is shaping up, with hindsight, that the management of MGR had some spectacular boot in mouth moments – holding back cars that would have sold brilliantly and releasing the also-rans that they did. You could have counted me interested if I’d had the money at the time this was due to be released. Aarrgh, just when I thought the frustrations at the loss of MGR were over this delight tumbles out of the closet. There was me thinking the pics were renderings, but what a sight that R55 must be in the ‘metal’. A definite 75-esque middle to it, but the rest is so Rover, so British. However, I’d agree it wasn’t what Rover needed right then. The 75 facelift sufficed in my opinion and was needed. However, the Mk1 still has clear road presence and stature. What Rover needed then was MINI, but BMW had other ideas (don’t get me started! ), and genuine replacements for the 25 and 45, one of which at least was kind of on the way. Am I the only one thinking Rover designs influenced the BMW 1 Series more than just a tad? The front reminds me of the new Jaguar XF just a little bit. When I first saw this, I was not too sure but, on a second glance, that is a really beautiful car. It looks rather low and sleek – something which could have given the brand a bit of support from the public. I do, though, understand the reasons why complications would emerge from this vehicle as other people have noted above – the costs of manufacture, marketing and like – and, as has been said, it may have been the wrong sort of car at that time. Ah, so that’s where Renault got the back side of the Megane from… urghhhh. This looks bigger than the 75. Par for the course then, small cars gradually getting bigger as the years roll on and finally outgrowing your garage. 8 of 10 for effort… Pretty nice in all aspects except the rear end. I agree with several others – from the rear, especially, it’s a Chrysler 300C with the ugly bits taken out. It would have certainly frightened the traditionalists but, considering it’s at least 10 years old, it hasn’t dated as quickly as some prototypes do. The wheel-at-each-corner with very little overhang makes it look as though it might collapse under its own weight in the middle. The size of the wheels seems massive relative to the actual body itself. This is a nice looking car and would have sat well alongside the Mk 2 75 with the family-look radiator grille. Unfortunately, in this day and age, the life expectancy of small-build niche manufacturers is short in the globalised market. What ever the actual brand name or marque on the front of the car, the cost of development of a totally new model of a car requires the resources of huge players like BMW, VW and the other American and Japanese makers. China is getting in on the act slowly and learning the trade Western style. Small-time players like Rover really didn’t have a chance if they got it wrong and re-skinning old models doesn’t cut it in today’s ultra-competitive marketplace. They had to invest heavily, past their capabilities, and get it right first time. British Aerospace: why did they want to own a car maker, where did that fit in with their overall corporate plan? BMW: why spend money on a brand that is going to compete for their own market share? They asset stripped the good bit, MINI, and sold off the rest and were glad to be rid. The Phoenix Four: well they made sure they were paid, well paid, and the company went to the wall through lack of outside investment and the lack of a joint venture with someone who saw a future in the whole company. SAIC and Nanjing: both companies bided their time, saw that MGR was getting desperate, strung them along, pulled out and bought the assets from the debris but not until Honda had returned to reclaim their IPR from the assets. Holloway : Ah, yes. Years ago, I did an Insider piece for CAR about the chassis chap who had been in charge of the MINI front end [and was, post-Rover, involved in a small sportscar car project]. Wasn’t a road tester killed at Gaydon during testing of the replacement 45 with the longitudinally mounted powertrain? It’s a pity this Richard Woolley design wasn’t shown to the executives of SAIC Motor/MG UK – this could have been the new MG6! This would have been a real head- turner!! However, the much maligned Marina was never out of the sales Top 10 during its career, and in 1973 was Britain’s third best selling car. For its time, this was the car the market wanted, simple, cheap to buy, fairly reliable( yes the Marina was reliable for its time) and with three body options. Yet it was also crude to drive, was ancient by the time it was pensioned off and never something buyers lusted after, unlike the first generation 400, which oozed pure class and deservedly sold well in the early 90s. This is what Jaguar is doing right now, and it is working well for them. In fact, a few tweaks to the lights and it could easily be a Jaguar design! I’m surprised that BMW let Rover go so bold and upmarket with this design, surely treading on the 3 Series? Mind you, perhaps they already knew the writing on the wall and were just humouring Longbridge. An interesting design… The article states that the Rover 55 would have had a longitudinal engine installation like the Audi A4/A5 but, unless the engine and gearbox are back to front, how can the front axle be so far forward? Audi engines poke out the front with the front axle tucked miles beneath the windscreen (see current A6) whereas this car has very clear RWD proportions with the unpowered axle able to fit as far forward as possible. BMW and Mercedes achieve AWD through a short prop from the transfer case to the front axle in the same was a Land Rover. It would seem more sensible and straightforward to have built the 55 and 75 Mk2 as RWD with optional AWD if these are the proportions. It’s a shame this car will never be built as, aside from the daft Bentley lights, it still looks great. This would clearly have been an effective 75 replacement and also proof positive that a car can look British through and through, without looking 20 years out of date. I reckon that it has echoes of the original S-TYPE and puts the MG6 to shame. Today our roads are full of distinctly French-looking cars, distinctly German cars, Spanish, Japanese, Korean… but few British. What a shame. A mini Chrysler 300C. It’s everything the 75 wasn’t – the Phoenix Four should have begged investment for this and rolled it out as an MG, reskinning the 75. Did any of the Designers working on this work on the 300C as well? Absolutely love the details on this design – especially the chrome into clear rear light segment – very cool! Unfortunately, I think the proportions need tweaking all round to look “right” in itself. Oh, and the front lights? Did they just not bother? Could have been great but, like I said over on the Rover AR18/R16 thread, nowhere near market ready. Mind you, much like the AR18/R16, I don’t think it was meant to be at this point. It’s by no means beautiful but would have turned heads and possessed a solidity and presence that the 45 definitely lacks. It’s almost cruel to present a series of proposals that could have saved the company – such a criminal waste of talent. Wow! I’m torn – is it ugly or gorgeous? Or a German view of British cars? Very dramatic though but too cliched for 2010. Rover should always be pioneers not retrograde – think P6, SD1 etc. I want to cry… fantastic! This is simply gorgeous and would have had great road presence. I can’t believe that this could be 10+ years old – I would spend my hard-earned cash on owning a set of keys for an R55 in 2010. Were there any sketches of how the interior would have looked??? This was definitely imposing and I am sure it would have taken Rover upmarket, but the front and rear ends seem to have been grafted on from a bigger car. It actually reminds me of that awful Rapport Ritz saloon featured elsewhere on this site. This car is so wrong. It is far too big and the styling is uninspiring – it reminds me of ADO17. It would have missed its target audience by a mile and is further proof that BMW did not understand Rover and its customers. An interesting and diverting concept for what would have been an odd-sized car for Rover, being in between the 3 Series segment (presumably covered by the 45) and the 5 Series segment (covered by the 75). Unfortunately, this car seems bigger than the 75 (that may be down to the over-large wheels though). It also lacks the charm of the 75, although it does have bucket-loads of presence, something that ARG/Rover products often lacked. We are all forgetting that Rover enthusiasts do not buy new cars – this would have sold well. All the 800 owners griped about the 75 when it appeared. It does beg a couple of questions, though: had this Rover 55 reached production, would the Jaguar X-TYPE a) have appeared as it did and b) have altered Jaguar’s recent path? I really like that – it has tremendous presence and still looks good 11 years on. To my mind, it looks like a logical evolution from R16. Yet another missed opportunity. Yes, it is a lot bigger than the old 45 but cars do get bigger as they evolve. I parked my Mk1 75 next to a new Mondeo and the poor old Rover looked tiny. If the plan was to enlarge the next 75, presumably to current Mondeo dimensions, with the 55 coming in at just under Mk1 75 size, it makes sense and is no different to what other manufacturers have done with their ranges. However, there’s no getting away from the fact that, in order to succeed, what Rover really needed was another R8. Geoff :It’s a pity this Richard Woolley design wasn’t shown to the executives of SAIC Motor/MG UK – this could have been the new MG6! This would have been a real head- turner!! I agree. MG6 is “safe” in recycling design themes from other manufacturers (front bumper notwithstanding) but it might consequently be seen as mediocre. This car is controversial but distinctive – clearly enough people love it for it to be a successful design. More proof of how far ahead of its time MGR design was – why on earth did they subsequently mess about with variations such as RDX60, apart for the need for a 5 door variant? Probably too late for Tata to abandon the Jaguar X-TYPE replacement and use this as a basis to relaunch a Rover sub-brand? Wierd, but wonderful! Has the modernity and “wow factor” the (nice but old-hat) 75 lacked and, size-wise, a better match for A4/Passat-types too. However, who did BMW think would have bought a 75+ sized model, when 800 and XJ sales proved how few people wanted a non-German limo? Why bother creating the transverse 75 from scratch only to replace it with an entirely different platform 5 or 6 years later? Did BMW not notice that Rover’s best sellers were the small cars that the BMW range lacked? Surely the priority in 1994 should have been the elimination of the Honda factor with a new platform with SWB and LWB variants for the Mini and 400 replacements? Perhaps then, with money coming in from competitive, desirable small models, thought could have been given to bigger Rovers? I may be the only sceptic here but I don’t believe this one bit. Rover has been dead for 5 years and we are just hearing of this now? I am sure this is a fake – if it was BMW influenced, we are looking at a design pre-dating March 2000 so it’s 10 years old. Not a chance. I take it you read the piece? There were dates in it. And, yes, it’s pre-2000. So what’s ‘not a chance’? An extraordinary looking car, ultra modern yet a bit odd, with a hint of landcrab about it’s proportions perhaps? It would have been expensive to develop with a brand new platform and a unique layout with the engine set further back to get good balance, rather than the nose heavy Audi layout. I wonder how space efficient this would have been? Thinking about it, don’t Honda Legends (post the Rover split) have a similar longitudinal layout too? The fact these images are real. It’s someone been handy with photoshop. I was purely repeating the information in the article. There is not a chance that anything like this would have been designed 5 years ago let alone over 10 years ago. The serpent alloys are too big and they both sit in identical places (note the position of spokes on both front and rear). They are not in proportion to the body and, back in 1999, it wasn’t the fashion to have these big wheels. The chrome door trim is of different sizes on both photos while, in the first photo, the rear numberplate chrome surround is too pronounced and then is much smaller in another photo. The rear end in the second photo is too compressed for the angle. The front end and vents are a rip off from the Maserati Quattroporte and, in different photos, the fuel cap has moved location slightly. The fog lamps would be useless positioned where they are. The shadowing is all wrong. What a superb looking car, almost familiar yet quite stunning! We will never see it now but it puts the MG6 to shame. Does this prototype really exist? This looks good and would have been a welcome addition to the market. However, it would not have been built as it would have taken sales from the BMW 3 Series. The 55 does, though, look bigger than the 75 – was the 75 meant to be LWB orginally? That’s an interesting comment about the longitudinal engine location. I think Honda may have experimented with this at some stage – maybe with the Legend (post-Rover days?). Anyway, apart from the front end (which looks like an NSU) the car sort of looks OK. It also looks larger than the 75, which may not be a good thing, but, other than that, I like the side and rear lines. However, not long after this, most cars started gaining a bit of height, so I can see why it was not put into production – it would have been too low-lined. That truly is amazing! Bold, confident and there clearly is a distinctly Rover (P5) corporate style. Let’s also clear up some of this nonsense about longituninal engines. The engine isn’t far back in an A4 – that would be front-mid like an R5 or 16 and is terrible for packaging just as having it reversed would be (R25 and many Audis). That’s also why most Audis drive so awfully. The correct layout as stated heretofore is to use a short front driveshaft (like a FWD-only Defender indeed!) Actually, the second-generation Honda Legend and Vigor used exactly such a layout. It’s been copied with a more engine-forward layout by Audi for the new A4/5. There are additional weight and friction drawbacks but, by modern standards, these are insignificant. The cost savings of having essentially a FWD-only BMW X3 powertrain are obvious. Another amazing find – thanks Keith! Why is this so hard to believe? Having looked at the photos for a bit longer, I’m of the opinion that this is a genuine shot. How many photoshoppers go to the trouble of putting in relections of surrounding vegetation or other cars? Also, as far as I’m aware, it has been common pracice to put big wheels on styling exercises for years; those wheels do look like Serpents, but the centres are different. Isn’t it also common for details of design models to be different on either side, or even interchangeable to allow designers to see the effect of different items of trim? As for the filler flap, that could be down to perspective in the different photos. Comments from the car’s Designer, Richard Woolley, completely unedited. ‘I was extremely flattered to hear that he couldn’t believe the car was designed more than ten years ago and his scepticism that it’s just a ‘Photoshop job’ is interesting, but unfounded. The car had an unusual proportion, so I guess the different views are difficult to ‘read’ for some folks. The model rode on 19″ wheels, (us designers love big wheels!) compared to the 17″ wheels of the 75, and again, added to its proportional novelty. The 75 in the background was our styling model (not an actual running car) and we shipped both that and the R55 model over to Ragley Hall to have the secret photo shoot. When BMW sold Rover, one of the contractual agreements was that all Rover-related models, images documentation etc., etc., were to be passed over to the new owners. This was duly done, but Geoff Upex made the decision to hang on to the R55 model (he was very fond of it!) and it remained in our stores here at Gaydon for a very long time. I suspect this car was the basis for a “new” Rover. That is, this chassis would have been used for the the 55 shown and a new 75, with those cars aimed at the U.K. market and America. By using a longitudinal front-drive layout, BMW could easily have used variants of its new engine families without having to change the location and mountings for ancillaries as must be done with a transverse layout. If anything scuttled this project, it was primarily cost. Based on the rear-drive Lincoln program Wolfgang Reitzle promoted at Ford – a new rear-drive modular premium platform that would underpin Lincoln’s 3, 5 and 7 Series (in size terms only) competitors, this car probably would have run $2.0 to $2.5 billion. That’s a lot of money. However, it would have provided a platform for a new line of unique and upscale Rover cars, while still leaving room for a slate of transverse front-drive vehicles in the volume market. Those cars would have included the MINI and (eventually) an R30 type of car – if Rover became profitable, that is. It would have been a tough slog in the U.S. market where the Sterling left a bad taste in everyone’s mouth and built on the lack of a quality reputation possessed by the BL cars. Even the first-generation BMW MINI (I had one and loved it) could be a nightmare. Some owners knew the Service Manager better than they knew their own wives! Simply stunning, but sadly yet another “what if.” I’d have happily laid out my hard-earned on something as good-looking as this. Did you get any interior photos? It is beautiful, but is it a Rover? Absolutely stunning and still good today. I think the bonnet is high enough to enable a gearbox in sump approach :-). Joking aside, I think it would be better if the frontal appearance was reduced in height. Richard Woolley is a genius… The Rover 600, the 75, the Range Rover Sport and now this fabulously beautiful Rover 55 design comes to light. Please, SAIC Motor, employ this man immediately and pay him a copious sum of money to inject soul, charisma and class into your cars. The Rover 55 prototype stands in marked contrast to the crushingly dull, unimaginative styling of the MG6 which leaves most enthusiasts of the marque hanging their heads in despair. Craig :Richard Woolley is a genius… The Rover 600, the 75, the Range Rover Sport and now this fabulously beautiful Rover 55 design comes to light. However, a better solution is: why doesn’t Jaguar Land Rover finally give someone of Mr Woolley’s talents (and clearly someone with a great ‘feel’ for the Rover marque in both a heritage and contemporary-led sense) the opportunity to develop new models such as this to bring the marque back? I, for one, miss the Rover marque and even now, eleven years on after the 75 first arrived in showrooms, still stop and admire the pre-facelift cars. The Rover 55, as with the 75, has soul, solidity and the right balance between paying homage to Rover’s illustrious design heritage and being forward thinking too. The only other remaining question is: what other bodystyles were actively being considered for the Rover 55 beyond the three-box saloon? The 55 is a good looking car even by 2010 standards, apart from the stupid wheels, and, at least in my eyes, only emphasises the ugliness of the 75. What is Richard Woolley doing these days? Is he still with Ford or did he come back to Land Rover? Oh, and on another note, what about his compatriot, David Saddington? This car makes an impression on anybody who looks at it and perhaps that’s why it has attracted so many positive comments. However, there’s something not quite right – it’s too bloated, not subtle enough. It needs smaller wheels, a smaller grille and a flatter boot. The car’s appearance isn’t sharp enough as it stands – its styling is, for example, at the opposite end of the scale to the E28 BMW 5 series. It’s a funny thing but I always thought a replacement for the Rover 45 could be called a 55. I can’t quite make my mind up about this car – it looks more upmarket than the 45 and bears some similarities to the 75 but, to me, it looks as big as the latter. I also think it looks a lot like a Chrysler 300C at the back and maybe a touch of Jag XF? Yes, the grille could be a bit too large and the headlamps too small but with a bit more re-working it could have succeeded. Having said that, I always like Richard Woolley’s designs! What a fantastic looking car – it’s got real road presence and would have taken Rover back to the top. According to this week’s Autocar, BMW are or were looking at reviving the Riley name – that would fit this car to a tee. As several people have noticed the longitudinal FWD wasn’t as per Audi but was similar in concept to a version of the Honda Legend/Vigor whereby a short driveshaft led to a differential which drove through or under the sump (BMW had used similar solution on a 4WD version of 5 series). Apart from the wheel at the corner stance there were also other benefits in terms of commonality with BMW RWD engine installations and were able to use adapted versions of conventional transverse FWD transmissions and the ease of making into a 4WD set-up gave potential for application to Land-Rover. The approach isn’t without it’s technical problems but there was a running mule which addressed some of these and apparently had very good refinement. Yes, on the Letters page. Autocar reckon that BMW’s Design Department has recently produced drawings of a modern Riley based on a current MINI. Does this mean the R30 would have been passed to MGR rather than hidden away in Munich, as legend supposes? It’s a pity MGR didn’t just adapt this more muscular style to reskin the 75 – that would be relatively cheap to do compared with the work needed to make RDX. MGR might have looked more like a serious player if they had managed to produce at least one new model – perhaps sales wouldn’t have been huge but it would have acted as an advert for the brand’s potential when trying to attract investment. Is it possible to buy one or two of rover 55 that was built in prototype. If so how many cost and where to buy ? 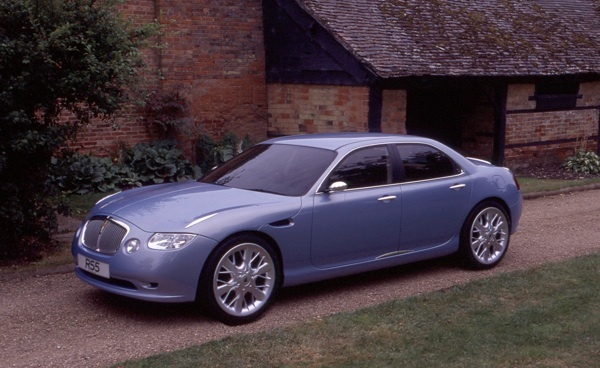 Am an fan of Rover 75 and the 55 one which i see, is genial. So i want to buy it. Beautiful car, really gained my attention. Just a terrible shame as to what may have been. I looked at that and couldn’t help but say “Oooh!” – that would have been a real asset for MGR. Am I the only one to think the nose has a shade of Conti GT about it? Such a catalogue of errors throughout the history, maybe it would be easier to list when they made a correct decision! It certainly looks interesting, if not quite “right”. When the American design company Aria did their take on the MG SV, they used a similar front end design and used exactly the same shutline. Perhaps the clamshell bonnet could have been an MGR trademark? Yep, Sam… I agree the front does have the slight look of the Conti GT – except for the headlamps? I suppose this R55 model would have been launched as a saloon initially (and maybe was only ever envisaged as such). It’s an interesting look for sure. However, I have a nagging question, who would actually buy this in preference to a 3 Series (which, let us remember, outsells the Mondeo)? What do you get that BMW can’t give you? It’s not even a hatchback. I just cannot see how the business case stacks up. Indeed, why make it FWD? If you’re going to use a modified BMW platform, why not just keep the RWD? That’s more in keeping with Rover’s history. There were two parts of Rover Group that did something that BMW couldn’t – Land Rover and MINI – so they’re the bits that survived. Just a thought but, if Rover was embarking on an elegant two model strategy and MGs were to remain sporting in nature, then was BMW planning to use a third brand for mainstream models or were they planning on being profitable with fewer sales? I don’t think BMW ever completely formulated their true marketing plan for the Rover Group. It’s all very sad. Looks excellent. Good stance, very accomplished surfaces. Not keen on the frontal detail but looks superb from rear three quarters. This may already have been mentioned but the Rover 55 above is not entirely dissimilar to the recent renderings of the X-TYPE replacement – is there a connection? It makes the new MG6 look a bit dated already and is yet another gem from the BMC/BL/ARG/RG/MGR etc back catalogue of ‘What ifs’… Its stance, though not its looks, remind me of the P6. I wonder what an MG or Coupe version would have looked like? Hmmm…. I’m confused. Did this model have the project code R55 (cf. the MINI’s original project code of R59), or was it intended to be launched as the “Rover 55”, or both? What exactly was its relationship to the R30 project? The R30 article mentions “a crash structure designed for an in-line engine” – presumably by “in-line” it means “longitudinal”? I can see some similarities with the early retro-style R30 renderings in that article too – presumably also a Woolley design? I suspect the roofline would have been raised a bit if it had gone to production, much like the Jaguar C-XF concept and XF production model. Price it lower! Do what Alfa Romeo and VW do and price it to undercut BMW and over Ford etc. and sell it as a sub-premium brand. That’s what Audi used to do and look what has happened to them. Sadly, it doesn’t matter now as this dead wood – I just hope that Tata see this and snap the design up. Would Austin work in the Dacia mould or have the public forgotten about it? Peugeot were rumoured to be bringing back Talbot to sell old 206s. I’ve revisiting AROnline a few times to view the 55 again and it’s starting to grow on me. I still think it would be better with smaller grille, larger headlamps and, say, 16/17″ wheels. It’s a pity this model has probably been disposed of – it would have been a good addition to the Heritage museum. What a beautiful car!!! Fantastic presence and class. How sad that BMW ditched MG Rover! How annoying to think that New Labour allowed the demise of MG Rover! It’s shameful when compared to, say, France or Germany, which see their motor industry as premium products and part of their heritage. I’m trying very, very hard of late to feel proud of UK and the legacy left by our inept politicians! I like the elongated Rover badge on the grille – it reminds me of the droopy P6 front grille badge. Another example of just how good the Designers and Engineers were… Sigh. Sadly, Jaguar Land Rover has little, if any, respect for preserving Rover Cars’ heritage. I was visiting the Heritage Motor Centre last year and heard that, when a fellow journalist wanted to borrow some old Land Rover photos for an article, Land Rover’s Press Office offered them to the journalist concerned without commanding a fee. However, if the same journalist wanted any Rover Cars photos, he would be charged a fee, even though the images were coming from the same source and Land Rover is now the custodian of the Rover marque. Land Rover are just as guilty of mishandling Rover’s remaining artefacts in the same way as Nanjing Automobile Corporation and MG Motor Co UK Ltd. have been. Too big, too half-arsed semi-retro, too ugly and wrong-wheel-drive to boot. Thank God it never made production. Let’s face it, Rover died in 1986 with the SD1. Everything thereafter was just an Austin in a posh skirt. Now, if we could have a new P6-type model – think Alfa 159 from the front but without the big toothy Alfa grille pushing the number plate off to the side, think RWD, think inline five, six-cylinder and V8 engines – well, then, I’d be happy. This Rover 55 would still not have been a proper Rover and it would have flopped badly had it reached the market. Ah, but, as I understand it, the Austin brand is owned by SAIC Motor. I think JLR are missing a trick not using the Rover brand. It would enable Jaguar to focus more on the GT end of the spectrum, with Rover as a ‘sub-premium’ luxury brand offering comfort and ride quality for a good price. Reviving Rover would also mean that JLR could cover all the niches now around with better focussed products – think Merc and how the brand is being diluted with all the different products. JLR have got 2.5 great brands – Jaguar for Sports/GT, Land Rover for SUVs and Rover for comfort and luxury. How about Jaguar having XJ (7 Series), XF (5 Series) and XD (3 Series) as 4 door saloons but with a coupe profile – think XF and A-M Rapide – these would look superb against the German offerings – and 2-dr coupes/roadsters based on the three cars above? Drop the XJ LWB and focus on Sports/GT styling, not luxo-barges. All that would then need to be added are the sports cars: XE based on shortened XF – pitched against the SLK – and the XK – targetted against the SL. Rover would come in and use the same platforms, with styling focussed on road prescence and not sporting behaviour -think junior Rolls. The range would be a 35 5dr hatch based on new Focus-sized platform – think Lancia Delta, a 55 4dr saloon/tourer – as seen above, targetting the C-Class, a 75 saloon/tourer – using the XF platform to create an E-Class rival and a ’95’ based on the XJ platform to compete with S-Class. The niches covered so far have been for luxury and sports. Rover could spin off MPVs from the 35 platform and the 75 platform or even use a 2 wheel drive Land Rover platform. This would also give Land Rover more space to move the Disco and Freelander into a more entry-level SUV, with more off-road detailing. The only niches then left are the city car and other the entry-level products. All this would be spun off from very few platforms – only 2 new ones would be needed. This could be the rebirth of the British car brands (I will not say manufacturing). If only Tata Motors would do this!!! I see that there are a number of comments about how Jaguar could take this on but remember that all Tata/JLR own is the Rover name. The IPRs for this particular car were probably passed to SAIC Motor if they weren’t retained by BMW. There are also yet more irrelevant comments about Chinese MGs being boring. The same people seem to be posting the same tedious comments all the time on all and any article regardless of the relevance. Hey, we get the message: some of you don’t like the new MG6 and there is no need to post it at every opportunity! Wow. What a great looking design. I would buy one. I drove a SD1 Van den Plas 3500 for 10 years I had to sell it when we went to Canada. I still miss it. The 75 was also a good looking car. Such a shame that they went down all the way to China. Reliability was their cross. 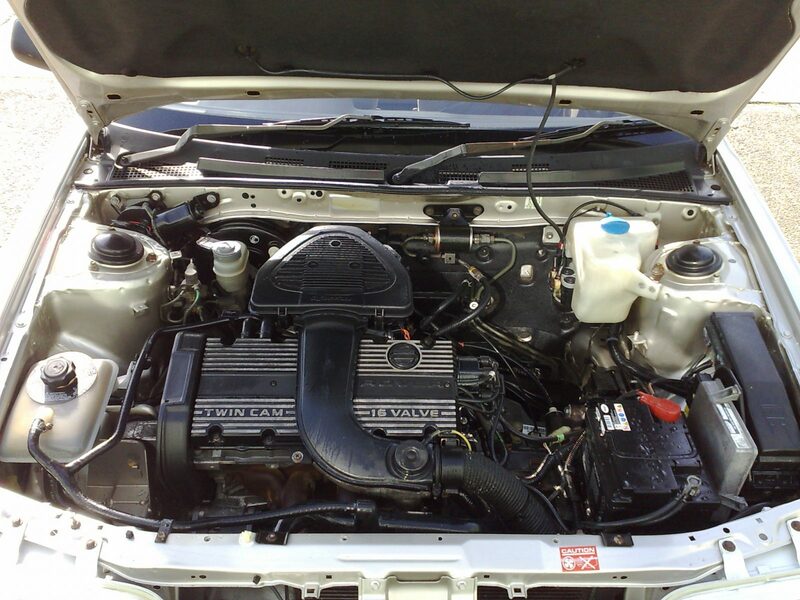 Although after a complete reno when I bought the car I never had much trouble(other than returning rust). Estate (new 75 Tourer) – V70/508SW (you could also do a Land Rover Estate car with 4 wheel drive). to fill the gap in the market below Jaguar. The Tata brand is not well known. Rover have over 100 years of car-making heritage behind them – if Tata start with new designs, they will be on the road to success. Nice sentiments, but taking the Rover name into the Supermini sector would actually do more harm than good for the rejuvenation of the Rover marque. I doubt that engaging the services of Peter Stevens would aid a Rover revival – he displayed little understanding of the Rover brand and its design values when facelifting the models, particularly the 75. He seemed to relish the opportunity to work with the MG saloons but showed little enthusiasm for the Rover equivalents – after all, why use a Lancia-inspired grille for the facelifted 75 when there are plenty of more elegant grille designs in Rover’s past? However, Richard Woolley and Lee Mitchell would definitely do Rover some justice. Hire Peter Stevens, Richard Woolley and Lee Mitchell to design the new Rovers to fill the gap in the market below Jaguar. Nothing can compete with BMW’s brilliant MINI, and I think it would be too ambitious to attempt this at the outset. Personally, I do not think that the Rover name has any currency and it is better to move on and celebrate the MINI, Jaguar and Land Rover brands. I hear that Alvis is making a comeback with a 1937 model -perhaps TATA could bring back the Morris Minor (do they own the rights to this now?) as I am pretty sure that this would be a big hit. You ride a queer chopper bike. LOL. This is a stunning car… I love it, again another management misadventure. Mind you, at least we have these wonderful photos to look at. Where is this car now? Does anyone know? That’s a nice looking car – it’s a shame that it didn’t make production. Incidentally, does anyone know what the Project Code of this car was? I believe that the car shown above was actually a scaled model of the car, not the ‘real’ full-size, working vehicle. The codename for it was R30. Sadly, it was one of those projects that was not actually at an advanced stage (e.g. production tooling had not been purchased or contractors given business in direct relation to it, beyond the tendering process). Indeed, when BMW decided to sell off Rover Cars in the late winter of 2000, R30 was around two years away from entering actual production, so anyone looking to build it would have had to have paid the bulk of the project’s development costs relating to putting it into production. After being absolutely stunned by these pictures back in August 2010, Then stumbling on them again whilst looking at the Hideous RDX60 http://www.aronline.co.uk/blogs/2011/06/25/in-house-designs-rover-rdx60/ And the Striking and quite Talented re work by Lee Mitchell made me think these two should of been the new corporate MG Rover styling theme, even now they were years ahead of there time! Thing is as much as I admire the 75, Iook how dated it looks next to this, As mentioned in the many replies (114 what a debate !) Perhaps the 55 should be more of a 75 replacement, which if the RDX60 was launched and replaced the 45 then the 75 wouldn’t be long for its “Face lift ” or a much bigger “55” make over. As for the negative comments about 55 The Bloody thing keeps growing on me, so much so that you forgive the Mad details ! And remember all new cars tend to look slightly odd until familiarities renders them normal, can you remember the strange styling of the mk1 Focus? which quickly blended into obscurity. Mr Wooley and Mr Mitchell should be proud of these designs but alas saddened by what they styled didnt make it! Even Launched now just a few days from 2012, RDX60 would make every Euro Hatch Bland by comparison, same with the 55 in the Mondeo class. One that got away ! Who owns the rights to this, JLR or SAIC? It looks more like a JLR car than a SAIC car. I’m confused. This was conceived as a replacement for the 45 yet its nearly as big as a 75 and reading this would have effectively replaced the 75 with that car then growing. That still leaves the 45, Rovers weakest model by far without a replacement. What was it about Rover/BL/BMC etc? They seemed incapable of getting the basic dimensions of their products aligned with the market. The Marina, Princess, Maxi, the 400 and the R3 all sat between normal market norms and all failed as products. As does a certain car currently being produced in LB! Looked like the cross between a Maserati and a Chrysler 300. The huge grille had visual links to the P5, and ironically would have sold well in China where they love their grille-y cars! Certainly makes the Roewe 350 look stunning. The design rights to the Rover 55 project were retained by the BMW Group when they sold off the Rover Cars division to Phoenix Venture Holdings in May 2000. Meanwhile the Rover brand itself is now owned by Jaguar Land Rover’s owner Tata. Although I am not too sure about the design of the headlamps or the huge presence of the grille, the proposed Rover 55 as a whole is a very striking car that still looks modern to this day. I think it would have grown on me very quickly if it had become a production reality. As for the Rover 75 looking old. Sorry, I disagree as I am always stopping to admire well cared for pre-facelift examples – some twelve and a half years after the 75 officially went on sale. Old fashioned and dated? No. Maturing nicely like fine red wine? Most definitely. In my eyes at least, it still looks like being in a class of its own. That was a brilliant looking car, such a shame that it never saw the light of day. What a shame this never saw the light of day as I can imagine a car with British heritage and BMW quality taking on the world. However,might it have damaged sales of the BMW 3 series, which is why it never saw the light of day. I honestly wish the Phoenix Four had seen this through, reformed the alliance with Honda to provide more reliable engines than the K series and got the 55 on the market in the early noughties. Also if Honda had a stake in the company again, and as the Accord was never more than a bit player, they would be very keen to get their hands on the 55 success story. I like it!! It’s certainly impressive – an exciting variation on the retro Rover theme. It’s another so near and yet so far glimpse at what might have been had BMW not ‘thrown in the towel’. A large car though. Too close in size to the 75 until its larger replacement came along?? They approached Honda, but Honda were no longer interested. That looks the business! No question, BMW dropped a massive b*****k by dropping this project. Dare I say it, but it has more presence on the road than the 75. I think that although an interesting concept of Rover building Audi’s, they would have suffered like the eventual 75 as being “softened” to avoid competing with BMW 3/5. As a result these cars could not have achieved sufficient volume in what is a “sports” focussed market to be viable. I think the missed opportunity by BMW was to reunite the Rover brand the much better regarded Land/Range Rover brand. Given that BMW was offering the still excellent outgoing 5 Series platform to Rover, Rover should have gone for a big (Volvo” like) Estate with obvious strong Rang Rover influences, the basic same body shell structure could have served as a basis for a High spec Rover V8 fully loaded with wood and leather and a Lower spec 4 and 6 cylinder family / school run play pen, in the same way the Range Rover / Discovery co-exist. For smaller cars to sell as an entry to the BMW range it would have made I think better sense to develop the MG brand, given the arrival of the MGF and following the RV8. This would have provided the opportunity to offer a a “Hot / Warm” hatch to fight the Golf GTI, Audi A3 etc as well as a Rover badged Mini MPV to take on the Merc A class, without risking diluting the BMW brand. Of course a 4 wheel drive variant of such a platform could then be used for the 2nd generation Freelander. Have you seen the design sketches of the Rover 800 fastback on this site? There’s one with a blacked-out D-pillar that looks remarkably like a 1980s Range Rover Sport. Had Rover Group jacked it up and given it AWD, it could have actually been one ten years before the X5 arrived. Perhaps the design language of Land Rover could have filtered into the Rover car range. I have a feeling that a clean, elegant avantgarde style (like that of contemporary Land Rovers) would have appealed to 1990s and 2000s consumers better than the chrome-and-wood retro theme that Rover went with in reality. Avant-Garde styling certainly fits in with the pre-Rover group Rover design language, and I think they could have pulled that off under Bee-Emm with a top-of-the-range line, to provide a niche aside from the increasingly mass market BMW. If BMW developed larger, angular Rovers like this, then they could have been in with a shot of developing an elegant, upmarket Rover, if Mini was fully developed in the lower end of the market, to the point of making 200/400 HHR sized Rovers unnecessary. However, good as the MG idea is, I think it an irrelevance to an enlarged BMW-Rover, a company without a significant space in the market, a bit like Triumph between Austin-Morris and Rover/Jag in the BL days. H Jones I think you missed my point about MG.
Whilst it is true that BMW have very successfully revitalised the Mini brand, by the 90’s it had been allowed to wither on the vine for years. Whilst MG brand had already been revitalised by the RV8 and had the up and coming MGF, the other big advantage of MG is that it is not locked into the “Mini” shape, which limits where you can take the brand. I believe that MG branded cars similar in concept to the Alfa Mito and Giulietta would have provided better lead in products to future BMW owners than the current Mini offering, without compromising BMW premium status and of course imagine how good the MGF replacement would have been with a BMW sized budget. So in my plan MG would never have been squeezed between Mini and BMW / Rover because there would be no Mini, which of course is hard to imagine, because in fairness to BMW they have done an excellent job with shifting Mini metal. The car could be launched today and it would look up to date but it would also look like a shrunk Roverised Chrysler 300C. If I were replacing a 400 in 2000 and had the choice of a facelifted version in the form of a 45 or one of these, I’d have picked the former. You do wonder what, if any, cohesive strategy BMW had for the Rover marque. Given that a cars life is anywhere from 5 to a maximum 8 years. The change from R55 to R35 means that BMWs original strategy clearly failed. To me a R25 replacment, R35, R45 (a mythical booted R35) and 75 would have given three platforms to develop the company. What intrigues me more than anything else is that no photos at all of R30 seem to have surfaced yet. Why do you think that is, Keith? On an unrelated note, this post is not linked into the main menu structure under ‘Concepts’ (or anywhere else that I can find). Just FYI. You know the more of these ‘defeat from the jaws of victory’ events I hear about – the more I wonder if there was specialist training in BL/Rover etc in the arcane arts of shooting oneself in the foot. This could have done so well..
Bad management by BMW? The only mistake BMW made was giving the incompetent idiots running Rover a shed load of money and accesss to all their technology and expecting them to develop decent cars with it. As ever BMC/BL/ARG/Rover whatever did what they always did when handed money, be it public or private. The p****d it up against the wall. BMWs only sin was to remain hands off. If they had swept out Towers and his cronies in 1994 and ran it themselves, Longbridge would be at full tilt building BMW Rovers today -just like Cowley is. A really nice car this,and i agree its a grower rather than a knock-you-dead car,but its nothing to celebrate,its an if only car,if only productionised,if only the firm was this, was that. What it shows is the talent of Rover designers and engineers,and what we could have achieved had things been different,and those designers and engineers had been doing this for years-the MGF was brought to us for the same money BMW would spend on flock lining a 3 series glovebox. Reference Paul’s comment about Rover management p*****g money up against a wall like they always did – I trust Paul that you were activeley involved – you were there in some capacity. If so, I bow to your superior knowledge – if not, I guess your comment is just (rather rash) opinion that probably ignores the fact that actually the guys at Rover were doing their best. I know it is fashionable to knock Rover (and anything historical) but sometimes a little deeper thought – about what is was really like then, rather than with this wonderful stuff called hindsight? There wasn’t a single design in the entire world that could have saved Rover. The only thing that could have saved Rover is built quality. Exactly what they didn’t deliver for more than thirty long years. Then there comes a point in time when things cannot be reversed anymore. Love the family resemblence to the 75 and the thought of a larger 75 on the same lines to follow…well, it would have made for a simply stunning duo. Pity BMW change policy on this one. I think the upmarket plan was correct and these cars would have delivered European sales as a luxury compliment to the BMWs. The photo shows how I would have liked a facelifted 75 to look. It’d have given the car another ten years of life and an initial big boost in sales (by this time the second hand presence of the original 75 would have convinced many more of the car’s innate worth). Richar Wooley – a genius. Richard Wooley – a genius. Not so me and my typing. MG UK joins HMG’s Scrappage Scheme : TF 135 to start at £11,511!